1) When upgrading font and rear. Will the brake booster and master cylinder need to be upgraded? or can the stock system work. 2) Where do i get the banjo bolts from ? 2) The rear calipers. can they bolt on to the existing stock rotors and would a bracket need to be made? There is a nice sticky by Justin on brake upgrades and another one by me on this here. Just search. Where do i get the banjo bolts from ? would prefer to buy it new.. what size is it.. can i get it in a hardware? no hardware. threading different. foreign used JDM no probs! heard the cefiro banjo bolts work. can anyone confirm this?? threading is same in most if not all. use the shorter of the two! anyone will work! 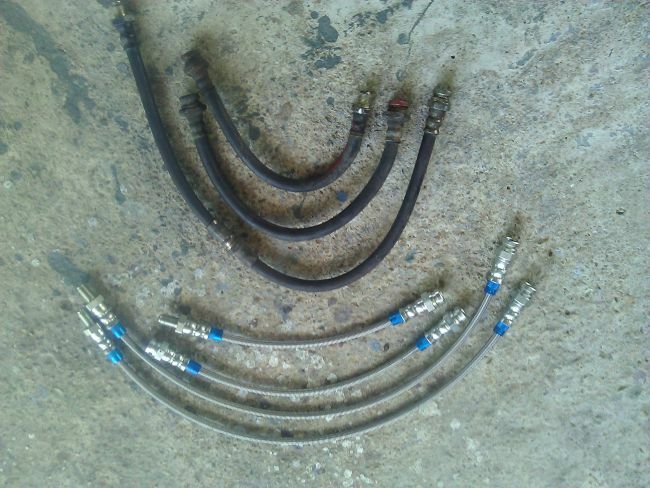 OP where you getting the braided ss hoses to buy? trinidad hose ltd.. they would make it exactly how u want it..
Trinidad Hose using back your old fittings or they putting on new ones on the hoses? Do you have an average of how much it costs? I'm about to upgrade my brakes as well & was planning to use Goodridge so that's why I'm asking. NR8 wrote: Do you have an average of how much it costs? . i havent done the brake conversion yet as i am waiting for a master cylinder from wilwood to arrive. and i havent done the measurements and what not for the lines as yet. So cant tell u how much it cost as yet. but ive estimated my entire conversion to cost around $4,000.00 in parts. wilwood MC for 350?I'm sure that's a typo. bro..where you get those parts listed so cheap?.. i have the same R32 brake setup on the ground, just to install. well the only problem with the rear calipers is how u are going to use the handbrake..
as far i know the p11 m6 version.. which has 4 wheel disk brakes.. which is the model i have. the handbrake is built into the hub. ^staff price of hose please? moving wrote: as far i know the p11 m6 version.. which has 4 wheel disk brakes.. which is the model i have. As far as I know the handbrake is integrated into the caliper. Could you let me know the price too please? you being modest. you know it's on the caliper. has anyone done the rear r32 conversion as yet. Dave-ve which vehicle/ brake setup are those for? Did you have to provide those new fittings or did they supply? And how long did they take to make them, if you don't mind me asking? Its for a 280zx. They have all fittings in stock and was made in less than 10 minutes.